Your child has been accepted into college! Congratulations, but here comes the hard part – how do you pay for it? A common option is the federal Parent PLUS loan, but how do you determine if it is right for your family? In order to receive a Parent Plus loan, parents must complete a Direct Plus Loan Master Promissory Note (Direct Plus Loan MPN). Note that most schools require a parent submits the PLUS loan application on StudentLoans.gov but some schools have different application processes. The loan can’t be borrowed by anyone else or transferred into another person’s name (the student you are supporting). You can borrow up to the total cost of attendance for your after financial aid. There is also no limit to how much you can borrow as long as you are not exceeding the student’s total cost of attendance. Parent PLUS loans have a fixed interest rate, which is dependent upon when it is disbursed. Every year on July 1, the new rate takes effect for the next academic year. For example, the 2018-2019 school year rate is 7.60%. It is important to note that this loan is unsubsidized. Unlike subsidized loans where the government pays the interest accruing while your child is in school at least-half time, during the six-month grace period (and other deferments) you’re responsible for all interest that accrues during the lifetime of the loan. Unlike some other forms of aid, Direct Parent PLUS loans don’t require your student to demonstrate financial need, although the Free Application for Federal Student Aid (FAFSA) would need to be completed as well as the Direct Student Loan. Approval is typically easier than private loan options because you aren’t subject to an income-to-debt ratio. You must be a U.S. citizen or eligible non-citizen and not have an adverse credit history to be approved. This includes debts over 90 days past due with a combined balance of $2,085 or more or in the last five years, a default, bankruptcy discharge, repossession, foreclosure, write-off of a federal student aid debt, wage garnishment, or tax lien. If your application is denied, you can ask someone with healthier credit to be (similar to a cosigner) who is a person that agrees to repay the Direct PLUS Loan in the event the borrower cannot. An endorser would enable you to seek to seek approval. You also have the option of appealing a denial if you can show there were extenuating circumstances causing it. If you accept the denial, your student will have the option to take an additional unsubsidized loan for $4,000 or $5,000, the amount depending on their year in school. Parent PLUS loans can be repaid under many repayment plan options. Most borrowers enter into the standard 10-year plan, but you can opt for the graduated or extended plans instead. If you’re looking for a more affordable option, you can consolidate the PLUS loan and apply for income-contingent repayment (ICR), which ties your payments to your income. The ICR plan is the only income-driven repayment option available to parent borrowers. The Parent PLUS loan is a flexible option for many families to cover college balances that isn’t need-based, has a lenient approval process and is subject to the same benefits as other federal aid options. We at Ascent Student Loans believe strongly that students and families should only borrow what you. 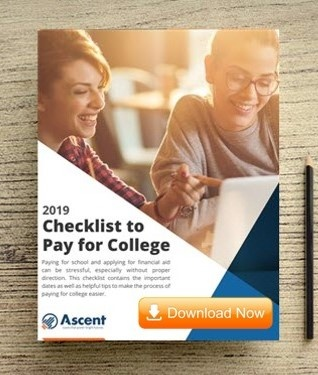 Check out this helpful article from our friends at Nerd Wallet, which discusses how to approach budgeting for college and where to start.